Heat oven to 375°F. Spray 13x9-inch (3-quart) glass baking dish with cooking spray. In 2-quart saucepan, heat water and rice to boiling. Reduce heat to low; cover and cook 12 to 14 minutes or until rice is tender. Remove from heat. Meanwhile, in 6-quart Dutch oven, cook whole head of cabbage in enough boiling water to cover about 3 minutes or just until outer leaves are softened. Remove cabbage from water; remove as many leaves as can easily be removed. Return cabbage to water; repeat process until 16 leaves are removed. In large bowl, beat eggs. Stir in ground beef, onion, salt, oregano, pepper and cooked rice. For each roll, place about 3 tablespoons beef mixture in cooked cabbage leaf; roll up, tucking in ends to completely cover mixture. Place seam side down in baking dish. Pour tomato sauce over rolls. Sprinkle with Parmesan cheese. Cover tightly with foil; bake 50 to 60 minutes or until bubbly around edges, cheese is melted and beef is thoroughly cooked. Cabbage is a cruciferous vegetable and is a good source of vitamin C and dietary fiber. When you’re at the grocery store shopping for cabbage, look for heads with shiny, crisp leaves. Avoid cabbage with wilted or bruised leaves. Place beef mixture in cabbage leaf; roll up, tucking in ends to completely cover mixture. Don’t rule out this recipe, even if you’re not the biggest fan of cabbage. There’s a reason why stuffed cabbage rolls are incredibly popular in other parts of the world, especially in Eastern Europe! The concept of stuffing savory ingredients into leaves dates back thousands of years ago and has shown up around the world from Europe to the Middle East to Amazonian forests. 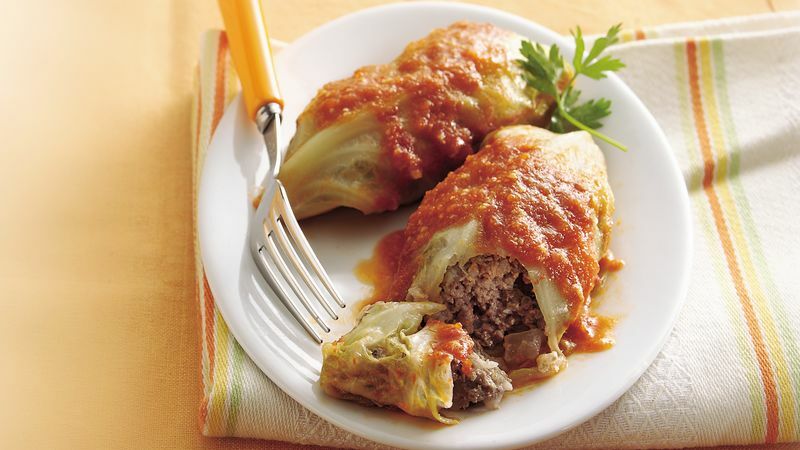 Stuffed with delicious ingredients like ground beef, tomato sauce, herbs and cheese, this recipe is super flavorful and balances the flavor of cooked cabbage leaves perfectly. This recipe is a great one to start with because it’s surprisingly easy and the ingredients are actually quite basic. Once you’ve tried this version, don’t be afraid to swap ingredients in and out! Other fillings that are popular in Europe include lamb and pork, and some cultures will even serve them with a cream-based sauce instead of tomato sauce.